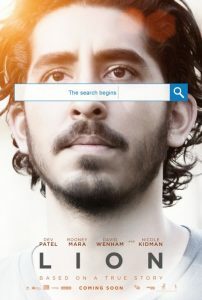 If child trafficking or the plight of India’s lost street children is the point of the true life drama Lion, then first time Australian director Garth Davis achieves a momentous and riveting family film made particularly poignant by the breakout performance of the young Saroo, aged five, wonderfully played with a resilience by screen newcomer Sunny Pawar. Hindi speaking Sunny Pawar portrays the streetwise Saroo, a young Indian boy who after losing his older brother Guddu played by Abhishek Bharate on a train platform in Khandwa, central India mistakenly gets on a decommissioned train heading for Calcultta, some 1600 kilometres away from his family and his beloved mother Kamla played by Priyanka Bose. Surviving on the overcrowded and voluminous streets of Calcutta, Saroo is eventually picked up by child services and placed in a poverty stricken orphanage. Fortunately, Saroo is adopted by an Australian couple John and Sue Brierley, played by Australian actor David Wenham (300, Public Enemies) and Oscar winner Nicole Kidman (The Hours). Fast forward roughly twenty years from 1987 to 2008 and the young man Saroo, superbly played by Dev Patel (The Best Exotic Marigold Hotel) who burst onto international screens in the Oscar winning smash hit film Slumdog Millionaire in 2008. In the second half of the film, set in Tasmania, Australia where the twenty something Saroo Brierley starts questioning his real identity in a move to Melbourne where his passion to find his real mother and siblings is ignited with the help of his American girlfriend Lucy, brilliantly played by Oscar nominee Rooney Mara (Carol, The Girl with the Dragon Tattoo). With the assistance of Google earth and threw a series of random calculations, Saroo manages to identify the exact train station in India where he first went missing and was fatefully separated from his birth family. 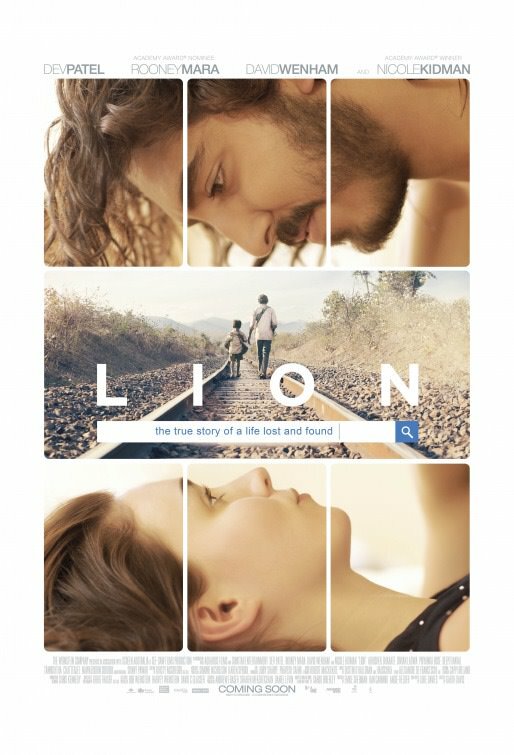 With a measured screenplay by Luke Davies coupled with stirring music by Dustin O’ Holloran and Volker Bertelmann, Lion is sure to pull at any audiences heartstrings, as the film intricately explores the issues of family, adopted or birth, identity and the continued quest to find answers. What makes Lion so exhilarating is the first half of the film primarily focused on the harrowing experiences of young Saroo expertly acted by Sunny Pawar who takes on each challenge in Calcutta with a tenacity and bravery that a very smart young boy is known for. Lion is assisted by strong supporting roles particularly by the ever versatile Kidman as Sue Brierley whose intense scenes with her adopted son, played by Patel are electrifying. Lion is a nuanced portrayal of one man’s search for his real identity, an emotional journey emblematic of the many train tracks he inadvertently stumbles on both literally and metaphorically. Director Davis focuses the emotional crux of Lion on an overwhelming human desire to find meaning in one’s existence and a naturally passionate urge to reconnect with one’s birth family. This is a fascinating and complex film, beautifully shot and exceptionally well-acted by Kidman and Patel adding to its cross cultural appeal which is even more refreshing because it does not have an American context. Lion is highly recommended viewing, an intelligent exploration of a truly extraordinary real life story spanning decades and two very different countries: India and Australia.